There are times when it can be refreshing to step away from the theatrical realm and explore other forms of artistic expression. It’s Not Yet Midnight has no story, little cohesion and sometimes has too much going on at the same time. Be that as it may, it was one of the most outstanding performances I have ever witnessed. It’s not every day you get to see a show that makes back flips look boring. The Compagnie XY delivers jaw-dropping acrobatics that seem effortless. You leave thinking you could do a handstand when you get home (even though you probably can’t). It inspires spectators to see the wondrous capacities of the human body. The performance has no real cohesion to it but I supposed that is normal for an acrobatics show. They don’t define themselves as a circus; don’t expect costumes and elephants and trapeze. The evening begins with a fight. With no music at first, the audience is slightly confused at the mundane look of the fight. Suddenly, the artists throw each other (literally) away and begin with a few tricks and we’re hooked. Soon the whole company is on stage pretending to want to rip each other’s hair off. It’s one of the only fights you will ever witness that looks artistically beautiful. The show also includes some dance. The lindy-hop is featured a couple of times but, to be honest, I’m not quite sure why. Sure, it presents a nice change for the audience but I’m not sure the extent to which it was necessary. I would have personally preferred more comedic skits in the acrobatic breaks but this is not a reason to miss out on the show. It just seemed a little random. One thing I enjoyed was the sense of humanity. Nobody’s perfect after all and neither is the show (although it comes close to perfection at times). Some moves don’t work out as planned. But the show must go on and it does so without anyone noticing that the artists didn’t manage to stand on two men with straight legs and instead fell in the arms of other acrobats. There is even a part where everyone on stage starts to laugh. Laughter? Why? 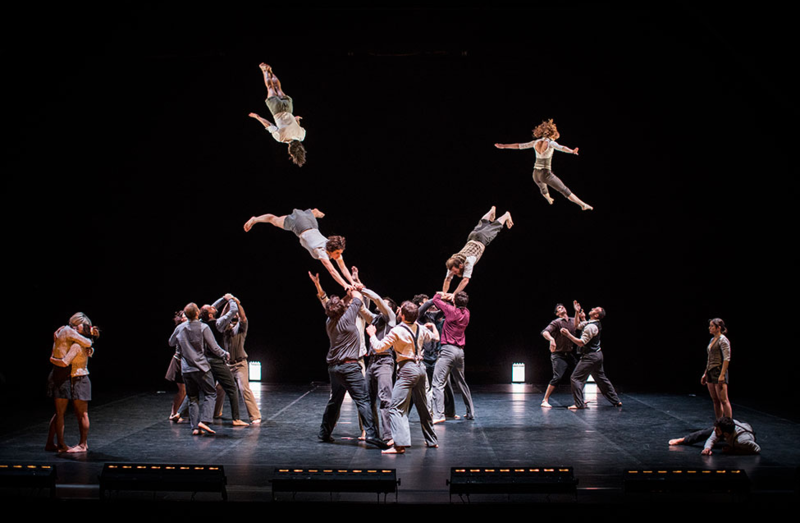 Because, again, Compagnie XY plays on their ability to make extraordinary moves seem easy. It’s nothing more than comical to create a 5 people column. Once the final girl reaches the top of the column she begins to giggle. Everyone watching is holding his or her breath for fear she will fall. But she doesn’t fall and we are all the more amazed at how she climbs down the 4 bodies as if they were just very steep stairs. Everything is done with ease from the amazing moves to the crooked columns. As the spectators applaud Compagnie XY with a standing ovation, one of the artists comes on stage and teaches us the company’s mantra: “Alone we go fast, together we go further”. Harmony is beautifully mixed with chaos in this acrobatic wonder. It’s Not Yet Midnight is definitely worth seeing. I suggest you keep the backflips to the artists; don’t try this at home, kids.